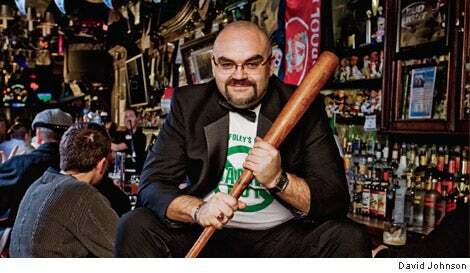 If Shaun Clancy, owner of Foley's NY Pub & Restaurant, ever decides to leave the hospitality business, he could transition into a top marketing job based on how he promoted his business last year. Clancy, 39, created an Irish Baseball Hall of Fame inside his restaurant, which earned about $1 million in sales last year. Some of the memorabilia he displays includes what are believed to be the oldest urinals in New York City and a can of the very bug spray used by the umpires in the 2007 playoff game when insects swarmed Yankee pitcher Joba Chamberlain. But his humorous take on marketing his business made him a local legend when he banned the singing of "Danny Boy" for all of March 2008, especially on St. Patrick's Day, because he said it was one of the most depressing songs ever written. Newspapers and radio stations worldwide immediately picked up the story, and most impressively, Clancy was singled out and roasted by satirist and late night talk show icon Stephen Colbert. Nice results for a local business. Meanwhile, national companies are frequently going small-time, releasing humorous ads on YouTube instead of on TV and establishing a presence on Facebook or Twitter rather than billboards. One major retail chain, for instance, released a video last year of a man who gives his wife a vacuum for an anniversary gift. Not pleased, she promptly escorts him to a doghouse where . . . well, you really just have to see it at bewareofthedoghouse.com. But this video, which was forwarded and Twittered across the nation, is so entertaining that when you learn that it was produced by JCPenney, only the most hard-hearted consumer could care that he's basically been watching a commercial. Burger King's Whopper Sacrifice campaign, in which people got a free Whopper if they eliminated 10 friends from their Facebook page, garnered a lot of national media attention during the eight days it lasted, halting after a disagreement with Facebook. The fast-food chain got free coverage in the Los Angeles Times, the New York Daily News, Reuters and more. Throw a pie in their face, but make sure you're selling them the whipped cream afterward. Don't initially set out to be humorous. That may be the most important aspect of humorous marketing. You don't want to force anything, says Linda Kaplan Thaler, whose advertising agency The Kaplan Thaler Group's clients include Procter & Gamble and Continental Airlines. The company is responsible for the Aflac duck and the Swiffer ads, where a mop and broom stalk their ex-owner and try to woo her back. "You need to not have a preset idea that something's going to be heartfelt or funny," Thaler says. Marketing "needs to be emotional in some shape or form." The humor should fit your product or service's personality. It sounds obvious, but even some brands that seem as if they could easily fit into humorous marketing don't--or at least as well as you might expect. Cult branding expert Bolivar "BJ" Bueno believes Miller Lite's humorous ads are lacking compared to others like Budweiser. "People drink to have a good time, and Budweiser has spent a lot of money to say, 'We're about entertaining you,'" says Bueno. In contrast, Miller Lite's message has always been that it's a lite beer. Calorie count is a serious topic to anyone concerned about weight, so wacky ads revolving around being lite don't really work in Bueno's opinion. Humor can work in even the most unlikely places. Lately, banks have been going with gallows humor in light of the economy. Last Christmas, Denver-based FirstBank offered tongue-in-cheek gift ideas on billboards: It suggested you take photos of yourself next to the signs, which featured a picture of a seascape. Then you could frame it and send it to your friends. The humor can't overpower the brand. The best humorous marketing ads take risks. Take Nationwide's "Life Comes at You Fast" ads. In one, a young man bumps the car of an elderly couple and apologizes. Then the elderly woman starts beating him up while a narrator somberly observes that not everyone handles "accident forgiveness" as well as Nationwide. As funny as the ad is--and it's pure burlesque--you never forget you're being sold insurance. That's a good thing. "If you're going to use humor in marketing, [make sure] you're actually selling somebody something," says Thaler, who then quotes her old boss: "Throw a pie in their face, but make sure you're selling them the whipped cream afterward."